So which is it? 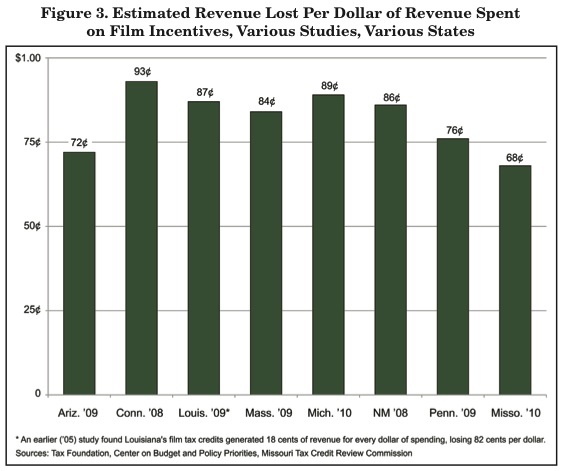 Is North Carolina’s Film Credit responsible for only 55 to 70 new jobs (“290 to 350 fewer jobs than would have been created though an across-the-board tax reduction of the same magnitude”), as a Fiscal Research study by fiscal analyst Patrick McHugh found, or is it responsible for over 2,000 jobs (PDF) in 2012 just for the “Iron Man 3” production, as a Motion Pictures Association of America Inc. study proclaims? That’s a question legislators are asking as they consider House Bill 994, a bill to tweak the Film Credit by ending its refundability. Under current law, if a production company qualifies for a greater amount of tax credits than its total tax liability, the state pays it the difference. H.B. 994 would instead allow credits beyond a production company’s tax liability to carry forward for up to five years. This film, like other productions, has an amount of direct expenditure, such as equipment rentals, which in turn stimulates so-called indirect impacts across the supply chain of the equipment rental industry. These expenditures also create new jobs as firms add labor to meet rising demand, which in turn raises incomes and stimulates what are known as induced impacts as higher incomes flow through to consumption. The total economic impact of the production expenditures is the sum of each of these direct, indirect, and induced impacts. In short, this is a model of sums — it is all plus signs. Despite what it says, it doesn’t measure the total economic impact; it measures only benefits expanded by whatever multipliers it used (more on that below). It doesn’t take costs into account. IMPLAN is the model of choice for special interests seeking public largesse. It’s a favorite of studies promoting supposed win-win scenarios of public construction of new sports stadiums, for example. Most recently in North Carolina, the recent trade association study (PDF) supporting North Carolina’s mandated renewable energy portfolio standard also used IMPLAN and also generated sensational results. They, too, are all benefit and lack any accounting for real opportunity costs. The authors do in fact provide traditional “secondary” multiplier effects, but what they seem to fail to understand is that the multiplier is the way by which total spending increases in the economy. Except for those “secondary” effects, any one dollar of investment in the green energy sector must come at the expense of a dollar spent elsewhere. In other words, they are robbing Peter to pay Paul, and claiming the program increased total spending because now Paul spends more, but they ignore accounting for Peter. There are potential ways by which transferring the money increases total spending, and that’s where the multipliers come in. The headline spending and jobs estimates the authors make are based on myopically accounting only for Paul. The fundamental economic concept of “opportunity cost” postulates that there are alternative uses of scarce resources, and the picture is incomplete if we ignore the path not taken. Nice to see a good take-down of the IMPLAN modelling approach. Those of us who do sports economics and urban economics seriously are almost constantly having to push back against those kinds of studies. The single most disturbing aspect of the IMPLAN model for local economic analysis is the wildly unreasonable values th[ey] have for multiplier effects (compared, for example, with the BEA’s Regional Input-Output Modeling System). IMPLAN is exactly what you describe it as, a “model” designed to generate large impact numbers to please a client who wants to lobby someone. The multiplier is a Keynesian concept, but what a proper multiplier should be is a topic of serious debate among economists. If politicians replace private spending with public spending that’s just as effective, the multiplier would be one. Harvard economist Robert Barro said the more plausible assumption would be a multiplier closer to zero. On the Keynesian side, Obama economic adviser Christina Romer (who is responsible for the still eminently mockable stimulus predictions) puts it around 1.6, and Obamanomics apologist par excellence Paul Krugman puts it at 1.5. Outside of the competing studies, there are other areas of concern with North Carolina’s film incentives. The constitutionality of the incentives is still highly questionable. They are an open-ended draft on the state Treasury without appropriation; i.e., without action taken by the General Assembly. The nature of film incentives — as our own history has shown — is that they are moving targets. North Carolina expanded our film incentives after losing a Miley Cyrus film to Georgia, even though it was written by North Carolina author Nicholas Sparks and set in Wrightsville Beach. Georgia, in which filming for the next “Hunger Games” movie is taking place, has expanded its incentives after “losing production” to North Carolina and other states. New York, which has more aggressive film incentives than North Carolina, lost Long Island-set “The Great Gatsby” to Australia. So the “sweet spot” level of incentives this year might be portrayed as “too small” next year as states compete with (a) each other and also (b) other nations to see who can pay film production companies the most. It’s what economists call a race to the bottom. Even if we take the MPAA report at face value, those 2,000 jobs would be no more now that the “Iron Man 3” production has left. Supposedly that’s the reason for keeping the incentives in place, because people’s jobs hang in the balance of the legislature paying outside firms to come and employ people in this state. I say “paying” because the outcry over merely ending the refundability of the tax credits has made it clear it’s not just a tax credit; it is a payment. The industry doesn’t even want the five years’ worth of carry-forward; they want the direct check. Legislators mulling incentives for film productions and other handpicked winners ought to ask themselves: Is this really how North Carolina should conduct business? Tax breaks for a favored few and state leaders at the mercy of threats by those same groups if changes are made, all the while still having to worry that another state will offer them a bigger bribe? Furthermore, as the benefits-only case for incentives shows that lower taxes and regulations entice industry to come to North Carolina, why offer them to just a few industries? Why not give them across the board? Cutting taxes, including the corporate income tax, would have a strong stimulating impact on the state’s economy, in terms of permanent job creation, outside investment, and greater economic growth, leading to greater state revenue. Jon Sanders (@jonpsanders) is the director of regulatory studies at the John Locke Foundation.